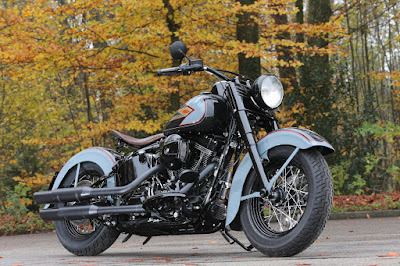 The definite "Distinguished Gentlemen's Bike" for a classic ride: Harley Heaven's antique style Softail Twin Cam combines 1930ties Art Deco Look with modern Power & Performance. Even if you are not a connoiseur in Harley-Davidson's history and tank designs, it is a fascinating fact that even the latest and most modern Harley-Davidson models can be "backdated" 80 years into the past by just changing a few parts and a different paintjob! 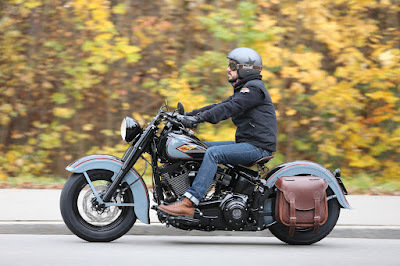 Discounting a few minor details, this "Antique"styled Harley-Heaven Custom has been retro-styled with the use of only two or three major parts: Front and rear fender and the leather saddlebag! What looks like a Thirties-style classic is in fact Harley's state-of-the-art 110 Cubic-Inch 145 Nm Power-Bobber in a Sunday dress! 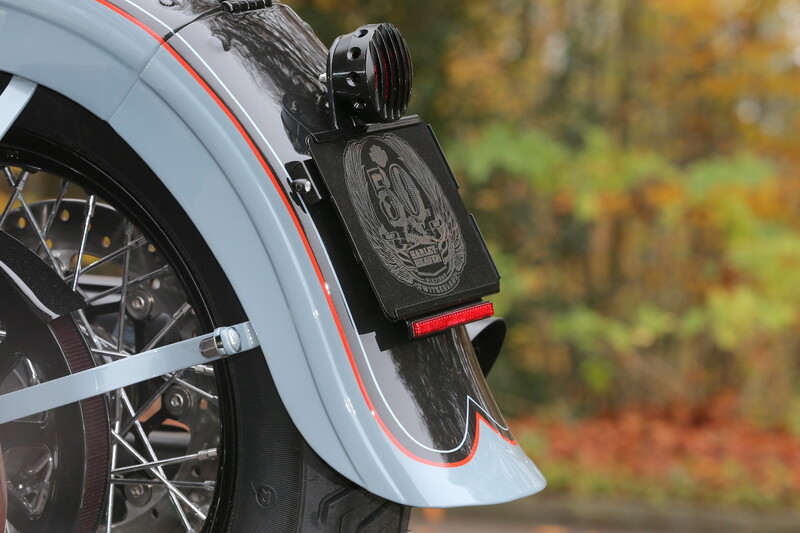 114 years after Harley-Davidson rolled out their first bike – and 50 years following Felix Baechli's entry in to the V-Twin business, this is the fifth "one-off" in the series of seven "50th Anniversary Baechli" customs. And an outstanding example of what is possible with a modest number of custom parts on a stock Harley! November is definitely not a great month to photograph motorcycles in Switzerland, but if you are hard enough to ride in next to zero temperatures and love the colorful leaves on the trees in the hillsides above Dietikon near Zuerich, you will still have a great time, even under dull grey skys and a rain front approaching from France. Harley-Heaven's fifth "Anniversary" Bike seems to be a completely retro-styled antique custom, but is a surprisingly "modest" effort in customizing, yet with an outstanding result that really catches the eye! 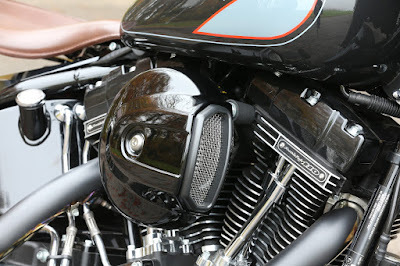 Yet, it did not come without digging deep into the "box of tricks" at Harley-Heaven's Customizing department, for some of the parts weren't as easy to adapt as it looks on these images. better-than-new restored 1947/48 UL Flathead was taken in front of the Bellikon garages that acted as the first shop location from 1967 on for quite some times and yes – the kid in the background is the young Rainer Baechli! "But looking through the history, there were more spectatcular options than the rather "uniform" colours of after WW II origin", adds Rainer – and the simple "Red Ball" tank emblem in use from 1947 to 1950, likely inspired by the legendary "Red Ball Express Route" of World War II which shipped the supplies from the Landing Beaches in Normandy to the advancing front lines against Germany from June 1944 to May 8th 1945. Especially in the Thirties, creativity "exploded" on the previous olive green paintjob that was popular after World War No. 1 and had a recent "comeback" in the very same "Slim" models as "Oliv Gold Denim" with a decorative white star as used as GI-marking on the WLA's. 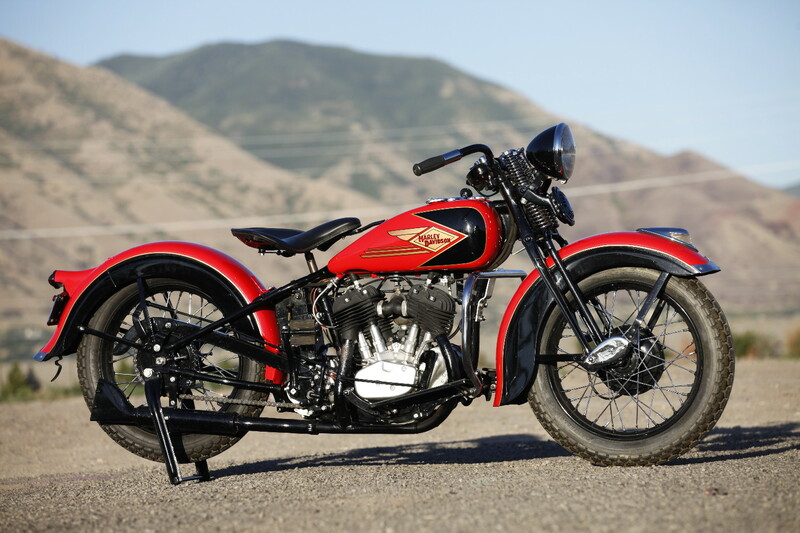 It started in 1933, by any means one of the worst years in Harley-Davidson's production history: An estimated 3.703 only (!) 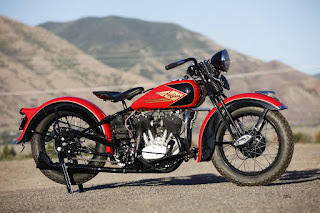 units rolled from the production lines in the Juneau Avenue Factory that year – of about 8.000 motorcycles produced in the USA, now deep into the depression and crime running wild. Indian had just been rescued by industry-tycon E. Paul DuPont, who implemented the bright colors of his chemical industry empire to the models of the brand – and Harley needed to follow up, if they would stand a chance. 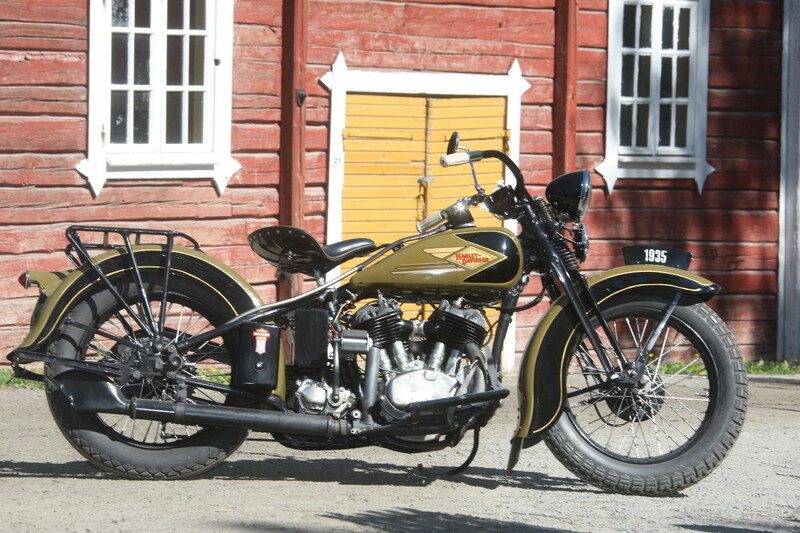 The 1933 model year not just saw numerous colour options, but also tank decals with a art-deco styled "Eagle" surrounding the classic "outlined" "Harley-Davidson" lettering, very rare today, thanks to the low production numbers of that model year. 1934, Franklin D. Roosevelt cutting his "New Deal" and additional money coming in from a trade agreement with the Japanese Sankyo Company who bought a licence for the VL model, looked a little bit brighter – and the "Flying Diamond" logo in "Art Deco" style would become an all-time design classic. With the stock "Slim S" already equipped with black painted drive train, frame, fork and exhaust pipes, the elegant black/grey version of the paint sheme was the natural choice for this project. 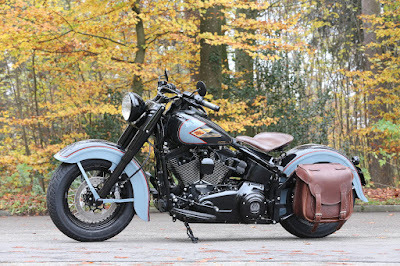 "The customizing time on this project was surprisingly short, resulting in a very competetive price for a very stylish and startling custombike", states Rainer Baechli, "but there was one part that did need some extra effort..." Both fenders are from W&W Cycles origin, OEM exchange parts for "the real thing", means period Harley's. While the rear fender, foldable, like the genuine part, was adapted to the rear 16-Inch spoke wheel without much ado, it was the front fender that caused headaches. 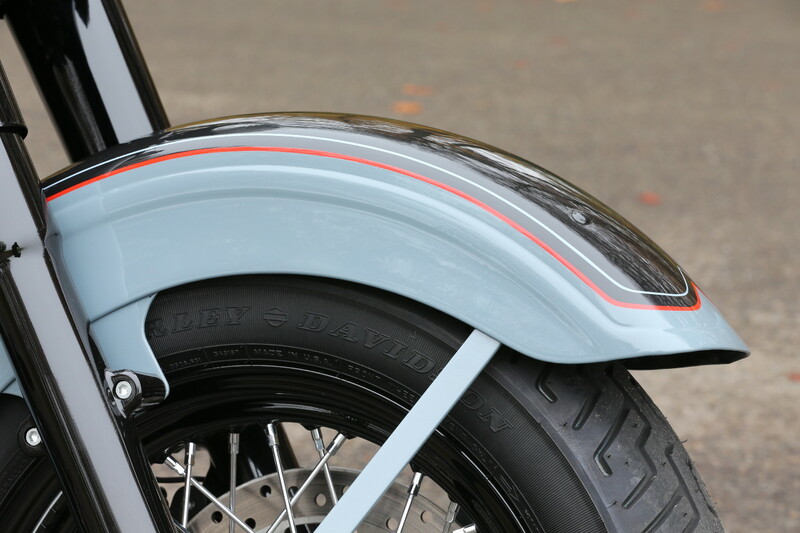 ABS and electronic regulators were either unknown or much smaller on the "classic" Harley-Davidson models of the pre-war years, it was the modern regulator that hit the curved tip of the front fender: "We had to re-think the idea and finally re-shape the front-fender position as was interfering with the 2017 regulator", explains Rainer, "and that was time consuming sheet metal work". 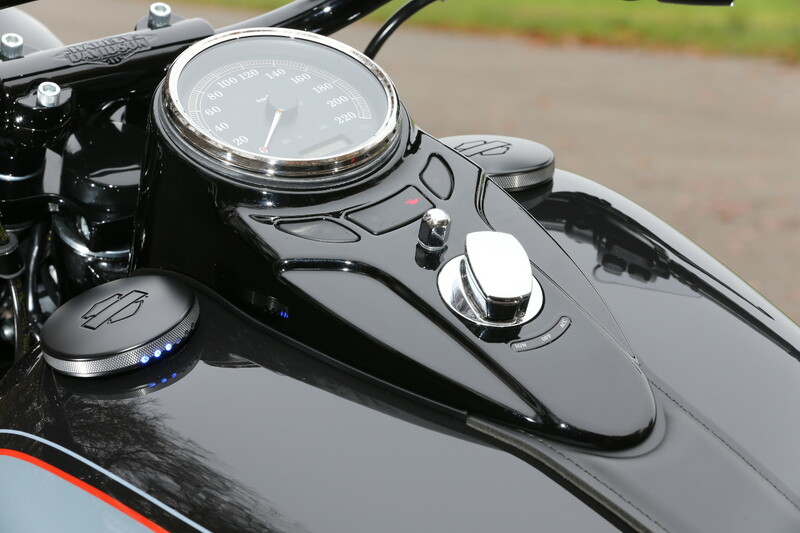 The end result is quite convincing, especially in the light that only those modern components that would discommode the classic look were exchanged for (even more advanced) modern parts: Check out the super-bright Kellermann micro indicators that are almost invisible. A classic looking taillight adds to the tailend, Swiss riders enjoy a small and exchangable license plate, which can be run with either motorcycle or car. The spring mounted single seat has been assembled from aftermarket components. The extra eyecatching factor on the left side is the big Lejonkulans Läderhantverk leather bag: No fancy modern plastic clips, heave duty leather straps like in the "good ol' times". 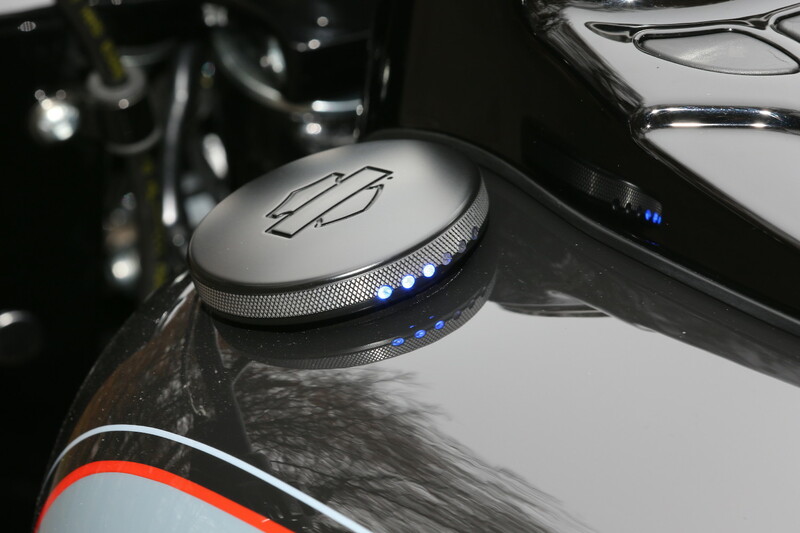 The Baechli Custom department created a special mounting bracket, anchored directly at the Softail frame, which also can be quickly stripped from the bike. 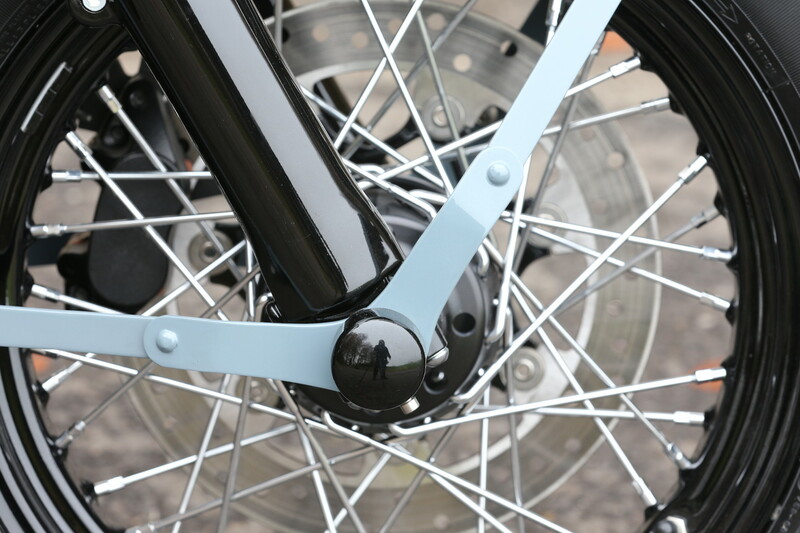 But as mounted, it also hides the all too modern belt drive to the rear wheel. 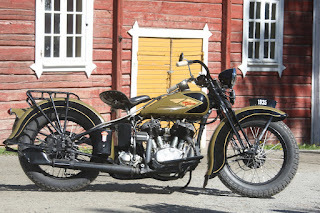 "The surprising "message" on this bike is how many stock "Slim" components ware retained and how well they fit the look", confirms Rainer at the walkaround of this "modern Antique". 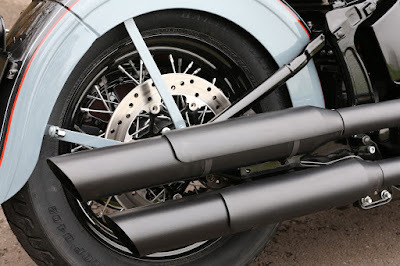 Not just are frame, rolling chassis, wheels, motor, drive train and brakes stock – details like floorboards, handlebar, instrument panel, headlight, "ribbed" coils, "cowbell" horn and even the often exchanged stock air filter fit the look perfectly. Round mirrors, tank caps and grips are Harley accessories. "There is the option of a homologated and fully functionable ABS Springer fork", reveals Baechli, "but we wanted to keep this particular "50th Anniversary" project bikes as close to stock as possible. 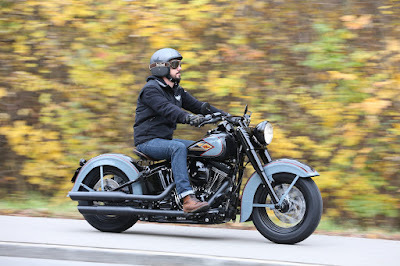 Anyway, this "antique" and elegant looking classic is a devil in disguise: The 92hp/145 Nm 110 Cubic Incher of Scream Eagle and CVO origin is one of the wildest and most powerful stock motor versions of the Twin Cam ever mounted into the Softail chassis. Place this ride into a time machine and beam it back to the year 1934 – you would have a motorcycle that would only be potentially but definitvely able to break the then existing Land Speed Record for motorcycles, 1937 pushed by Joe Petrali to 138.183 mph. The 110 Cubic-Incher gets a smile on every riders face, even when you are riding only slow and in search for a photo location. 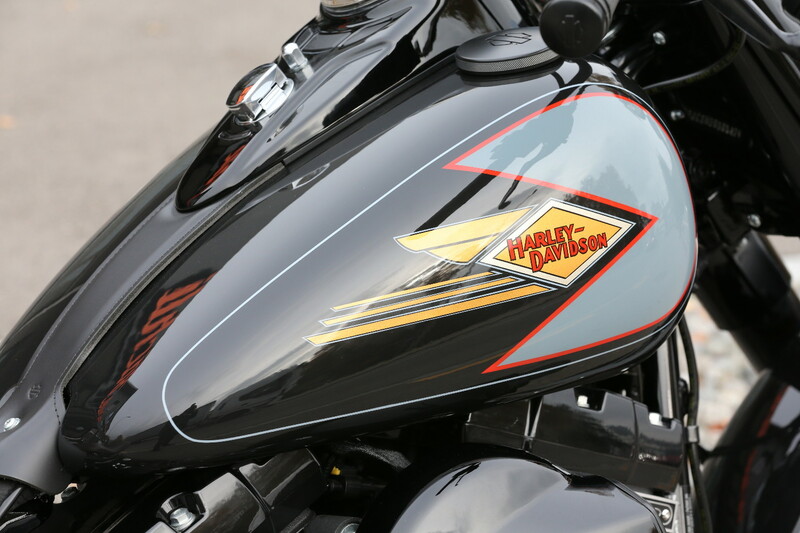 The powerful thrust from the lowest rev-range is impressive – and a fitting "farewell" to the era of the "Twin Cam" models, now part of Harley-Davidson's history. 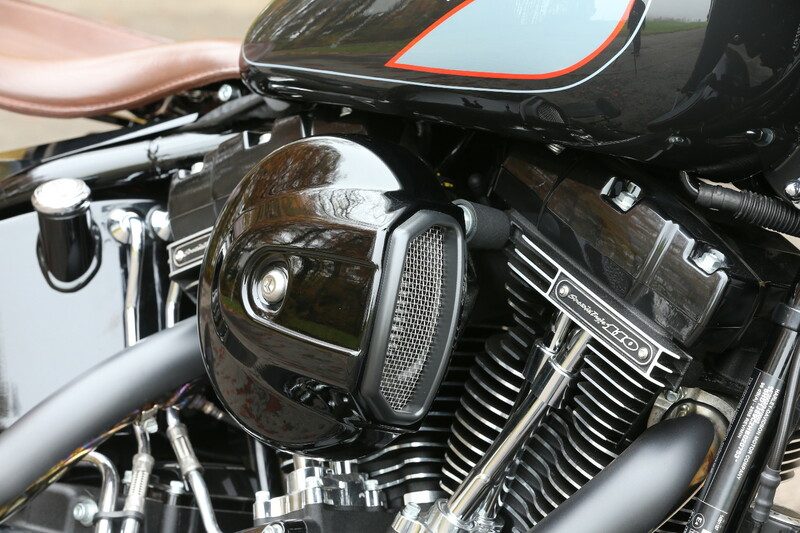 While photographing the "#5" of Harley-Heaven's seven 50th Anniversary Motorcycles, images of the #6 arrived and the seventh – and last – project is in the planning, "most likely one of the new 2018 models to complete the circle", smiles Rainer, "with the experience of the "Flying Diamond", we certainly will have more requests for such retro-styled customs rather sooner than later." He knows his clients quite well – and this bike will act as inspiration to other Twin Cam customizers worldwide! 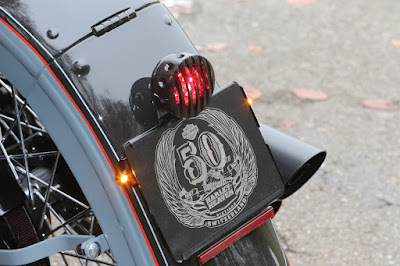 When riding the bike, you should be prepared for curious looks and questions like: "WHAT year has this bike been built? 2017? NO WAY? Absorb them or let them drip off – this bike is worth the silly inquisitions. You can always surprise them with a quick ABS-stop on the spot, or a twist on the throttle: The "Flying Diamond" is here – to fly! Low and fast! 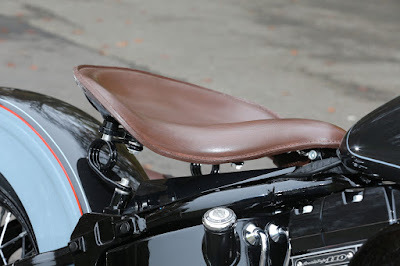 Name/Bezeichnung/Name/Nom de la moto/Naam van de motorfiets/Nome della Moto/Nome da Moto: "Flying Diamond" FLSS "Slim"
Modell/Model/Modèle d'origine/model/Marca e Modello/Modelo de Origem: H-D FLSS; "Slim"
Airbrush-Gemälde/Design/Airbrush Art/Design/Peinture speciale/ontwerp/Aerografie/Artista: 1934/34 Art Deco "Flying Diamond" Graphics. 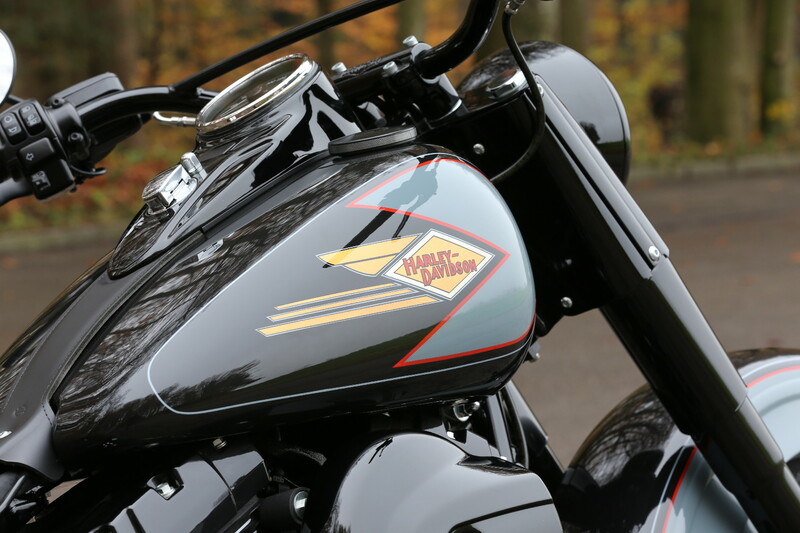 50 years business for American V-Twins in Switzerland! A date that is defining Swiss Motorcycle history: In 2017, Baechli Harley-Heaven, Switzerlands biggest and most successful Harley-Davidson dealer is celebrating all year around the start of the motorcycle business started by Felix Baechli in 1967. The last weekend in March saw the "official" party, but while lacking an "official" starting date, such as an entry into the commercial register, 1967 nevertheless saw the start of Felix Baechli's business from humble beginnings in the home garage – where it was staying for a surprising long time!